Being fifty-something, I’m keenly aware that every family has its own lexicon, its customised style of verbalisation that connects with no one in the outside world. 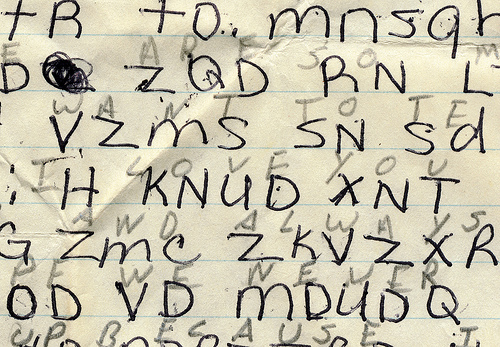 It’s our secret code … and we’re getting better at it with age. When we get gabbling in our family-speak, we might as well be conversing in Vulcan. When someone in our family gestures to you (mid-sentence) with a “C” shape formed by their thumb and forefinger, you know you’re probably chanelling Mum (her name was Clare) by discussing the weather or the dangers of travel. “Beware the Ford traffic” is a general warning /reminder about the peak hour rush and “snow on the You Yangs” hints at a snippet of family folklore (or is it?) that gives an instant green light to giggles and guffaws. There is “Tom’s wooden leg” and the “flames at the crematorium” … neither of which actually happened but either of which instantly communicates (in our family) that you might have your memories muddled. A simple one-word email or text of the word “ning” means it’s time to start organising the Christmas celebrations. At a family gathering, just uttering the word “ning” can activate a lyrical yule-tide sing-song that’s goes on (and off) for several (annoying) hours. The only way to short-circuit the “ning song” is to start a game of “Harvey Germs” by miming an injection into your upper arm. This is the one game we can still beat the younger generation at (and they love it). The language of families is bound up in shared experiences. It’s the “inside joke” that lets you know you belong, that this is your tribe. Sharing our family vernacular here on the blogosphere is not a betrayal … it means nothing unless you’re a part of the inner circle, part of the action. You don’t “get it” until you’re fluent in the doublespeak, and that can only happen with years of full immersion in our dialect. Over the years, we’ve welcomed partners and children into the fold via our vernacular … it’s a rite of passage that signifies acceptance. I liken it to the acceptance our boyfriends achieved when they survived a session with Dad and his home-brew. It means zip to the outside world, but ensconced in that pergola-with-walls-that-became-a-man-cave, downing a few home-brews carefully decanted by Dad from amber long-necks into the single-purpose clear glass jug, meant that Dad thought you might be good enough for one of his daughters. Then, and only then, were you apprenticed into learning the language of OUR family. Does your family have its own dialect, gibberish or jargon that means you belong? We have special names for people that only our family understand who they relate to. “Mrs Backdoor” was the old lady next door that spent all her time in her yard. “Mrs Fluffy’ was the name for a lady who’s real name was Mrs Wooley. “Nonnie” was code for Lauren, my Mum and”Old mate’ applies to anyone who we are currently in discussion about. These are just a few that come to mind!